Oxidative damage to cell membranes which are made up, in part, from lipids. Lipids are fatty acids, or substances derived from fatty acids, like natural oils, waxes. Lipids do not mix well with water, they are considered hydrophobic. They store energy, make up cell membranes, form the water repellant surface of leaves, and even act as steroid building block for hormones like testosterone. Fat molecules, like triglycerides, are lipids. Triglycerides are mostly stored in adipose tissue known as your fat. The term “saturation” in biochemistry refers to how saturated a fatty acid is with hydrogen. In a saturated fat there are many hydrogen atoms attached to a carbon backbone, if there is there is a single bond between pairs of carbon atoms it is called saturated. When there is a double bond is is unsaturated. See the difference at the = in the two following diagrams from the Khan Academy, where much of the following information came from. Saturated fats are packed close to one another and dense, they are solid at room temperature like a stick of butter or the fat on the edge of a steak. Unsaturated cis fats, like Olive Oil, tend to be liquid at room temperature. Or course, we all know that unsaturated fats are good for us, so in general eat fats that are liquid at room temperature and avoid those that are solid. However, there is an unsaturated fat that can be problematic–trans fats. 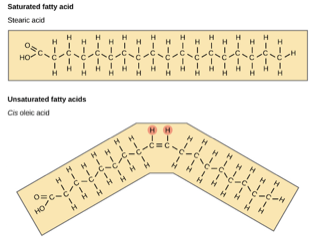 Fats with trans bonds are rare in nature, but have become ubiquitous in our diets because of an industrial process called “partial hydrogenation.” In this process, hydrogen gas is passed through cis-unsaturated oil to partially convert some, but not all, the double bonds to single bonds. The goal is to improve shelf life and stability of unsaturated oil by giving them the solidity (density) associated with saturated fats; like some shortening are oils converted into butter consistency for each of use in cooking. Since oils are cheap, there was a huge economic purpose in changing nature. But, this also increased the risk of coronary heart disease to the point where the FDA is requiring all trans fats to be eliminated from food stuffs. Omega-3 and omega-6 fatty acids come from two precursor substances: alpha-linolenic acid (ALA) for omega-3 and linoleum acid (LA) for omega-6 types. These are called essential fatty acids because the human body can not synthesize them–they must be obtained through one’s diet. These acids have at least two cis-unsaturated bonds, while the most bonds (6) are possessed by DHA, an omega-3. These acids are implicated in health benefits such as decreasing triglycerides, lowering BP, preventing blood clots, heart health and even regulating mood. See the section on Omega-3 fatty acid on this website. Cholesterol is a steroid, it is mainly created in the liver and serves as the precursor agent for steroid hormones like estradiol and testosterone secreted by the ovaries and testes. It also plays an initial role in bile acid and vitamin D processing which is essential to health. It is a component in cell membranes. It is also found in the bloodstream where its low-density form (LDL) is considered dangerous to cardiovascular health while its high-density form is considered protective. Next let’s explore how to use nutrient fats in the normal diet.